What is a holy well? What might appear to be a simple question is not easily answered. Hope (1893) is perhaps the first scholar to attempt a thorough account of the subject and includes a wide range of sites which include petrifying, haunted, ever-lasting, curative and those dedicated to saints such a clear and formal definition. The author for his series of works defines them as natural springs or even dug wells which have attracted religious, cult or ritual associations but for this article I have restricted the definition to those bearing a Christian dedications being called holy or named after a saint. The range of dedications is much more limited than surrounding counties, particularly Yorkshire, most being called simply Holy wells (10 confirmed sites, 20 possible sites), and those with names are restricted to presumably foreign or biblical saints: St. Mary (or rather Lady Wells) (9 with an extra 3 possible)*, St. Ann’s Well (2), St. Helen (1/2), St. Catherine’s (2) and St. John (2). 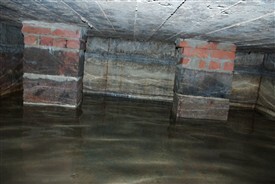 With a possible St. Lawrence dedication, Jacob Well and Lord’s Well. “two selions lying together at St. Helen’s Well, between the land of the Church of St. Katherine of Cossale on one side, and the land of the said Eustace on the other side, abutting at one end on the croft that Walter Talpe holds, and at the other end upon the north conduit”. Presently many holy wells in the county consist of boggy overgrown morasses but this may not have been their condition at the height of their usage. Others have been rebuilt over the centuries whilst others such as the Holinwell retain a naturalistic nature. There does not appear to be a specific design for holy wells per se, but it appears a common structure was a brick or stone arch such as seen at Headon, Mansfield and Nottingham. This would appear to be the most substantial but easiest way to protect the waters. More function would be a bath structure suggested at Mansfield’s Lady Well, Southwell’s Lord’s and St Catherine’s Well but not fully described. St. Ann’s Well, Nottingham according to Thoroton (1797) flowed into a rectangular stone lined bath covered by an arched stone or brick roof, with some steps leading down into the water. The best known and only surviving bath, is that of St. John’s Well, Winkburn of which Mee (1938) describes as a stone basin twelve feet square with a flight of steps entering the water, although this dates from its development as a spa. 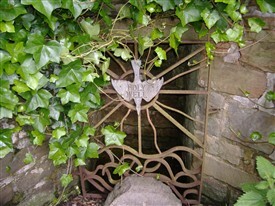 The county’s holy wells are not as endowed with traditions compared to neighbouring Derbyshire, Yorkshire or Lincolnshire. This may be due to the lack of any early records of their history. Except for St Ann’s Well, Nottingham and Newark’s St. Catherine’s well no wells have been recorded in detail pre Morrell’s 1988 attempt. This is unlike Lincolnshire whose sites are recorded by folklorists Gutch and Peacock (1908) and Rudkin (1936). The lack of a folklore volume in the Folklore society series may have resulted in a poor record of traditions and sites. We of course should not read too much into this, being the type of money making scheme such as Greta green or Swearing the Horns at Highgate. Newstead Abbey’s Mary’s Well or Monk’s Well was thought of as a wishing well and visited by pilgrims. The anonymous author of the 1950s guide states that one must drink the well and make a wish, but not tell anyone. They note that there was a recent case during the Great War, but gives no detail. The modern guide to the gardens notes that it was still used in the mid 20th century and its icy water was thought to have magical properties! “good for rheumatics and scorbutic diseases”. 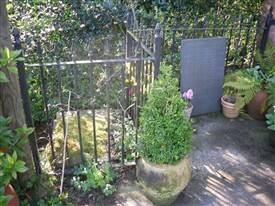 The late dedication of the site underlines the peculiar nature of the county’s holy well heritage. A heritage which with the exception of two sites, St Ann’s Well Nottingham and St. Catherine’s Well Newark, is fragmentary, a subject that appears to have escaped the attentions of antiquarians and historians and such although research indicates it follows trends elsewhere the lack of traditions suggests much has been lost and coverage is patchy. * not including Orange’s (1840) Lady’s Bath as a possible origin of Lady Bay and a possible Lady Well at Egmanton, said by the Reverend Levy to have been associated with the vision of Our Lady to a local women at the edge of Ladywood. However, correspondence to long time residents in the parish has not revealed knowledge of the site nor has the Nottinghamshire record office. Interestingly, the suggested site does have oil wells which may suggest that the vision was due to a Willo the wisp! Copnall, H. H., (1915) Nottinghamshire County Records – notes and extracts from the Nottinghamshire county records of the 17th century. Nottingham. Dickinson, W., (1787) A History of the Antiquities of the Town and Church of Southwell, in the County of Nottingham. Nottingham. Foulds, T., (1994) The Thurgaton Cartulary Stamford. Mastoris S., (1998) Sherwood Forest in early 17th century. Scales, W. J., (1896) St Catherine’s Well, Newark-on-Trent, Reliquary 2 pp 52–3. Stevenson, M. A., (1911) Report on the Manuscripts of Lord Middleton possessed at Wollaton Nottingham London. Voigner-Marshall, J., (2003) Lord Byron’s Newstead Abbey. Australia. Walker, V., and Duncan, G., (1940), Newstead Priory: Cartulary, 1344, and Other Archives. Nottingham. This page was added by R B Parish on 07/02/2013. I would have thought that Bulwell, Chilwell, Cauldwell, Norwell, Southwell and others might have had significance. Could it be that most wells had a Holy significance in that a well drying would create significant problems and therefore worth venerating.